Of Mar, at Residential Hospice Grey Bruce in Owen Sound on Friday, December 5, 2014. 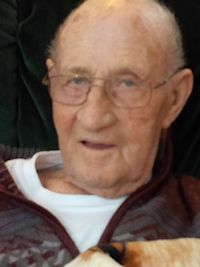 Harvey Alfred Weir at the age of 87 years. Loving husband of Elysbeth “Betty” (nee Koepp). Cherished father of Steven and his wife Joan, of Kitchener, Gary, at home, Kathryn, of Clavering, Michael, of Baden, and Della Eckersley, of Edmonton . Devoted grandfather of Nicholas, Mark (partner Ashley), Christopher, Kevin, Jennifer (partner Kyle), Eric, Natasha (partner Kyle), Scott, Tristan, Sienna and Randall; and great-grandfather of Zoey. Brother of Edna Day (late Allan) of Kingston , Lorne and wife Mary, Hester Cunningham (late Tom), Jack and his wife Clara, all of Wiarton, and Maisie and her husband Howard Hepburn, of Hepworth. Predeceased by his parents Archibald and Alice; brother and sisters, Mildred McArthur (late Jack), Don Weir (late Joyce), Janet Barnes (late Roy), and infant sister Marie Weir; Betty’s brothers and sisters; and by a son-in-law Lee Eckersley. Sadly missed by many nieces and nephews. Friends may call at the Thomas C. Whitcroft Peninsula Chapel, 272 Berford St., Wiarton (519) 534-5341 on Tuesday, December 9 for visitation from 2-4 and 7-9 PM. A service to celebrate Harvey’s life will be conducted from the chapel on Wednesday morning at 11 o’clock. Cremation with interment in Colpoy’s Bay Cemetery. Donations to the Residential Hospice of Grey Bruce or Make a Wish Foundation would be appreciated.